The Neymar saga is over and the deal finally went through with Neymar joining PSG for €222 million. This deal broke all previous transfer records and made Neymar the current second highest earning footballer. While PSG and Qatar are happy with the deal and thousands lining up outside the PSG official store for a Neymar jersey, this deal has drawn criticism from many others including Arsene Wenger and Jurgen Klopp. Such ridiculously high transfer prices will not be sustainable in the long run. Currently, AS Monaco are an example of what a club needs to do to become a sustainable football club. In economic terms, when an asset’s price rises to a value that exceeds its actual true valuation, then it results in an economic bubble. Generally, it is the market participants that drive the value above its true valuation. When this asset price rise goes on at an unchecked rate that cannot be justified by financial theory, it often results in a sudden collapse. This bubble is somewhat seen in modern football. In the football world, the asset is the player and the market participants are the clubs. The monstrous transfer price and buyout clause are not only damaging to the game but are increasing club debts. UEFA revealed the list of the clubs with the highest debt and the figures do not look good. The top 6 clubs with the biggest debt itself have figures above £200 million. Clubs with the highest debt as per UEFA. Manchester United has the highest overall debt with £465 million followed by Benfica at £291 million. Inter Milan have a debt of £265 million, Valencia at £247 million, QPR at £242 milllion and Italian giants AC Milan at £216 million. Barring a few clubs, many others have accumulated the debt due to the huge transfer spending being done each summer. QPR, which is not even in the top flight, indulged in heavy spending in the past which has left them financially crippled. Big clubs like Real Madrid are no different. ESPN reported in 2001 that Real Madrid was in a debt of £175 million pounds. This increased to €602 million in 2014 as reported by Goal. It also reported that Madrid publicly claimed to have less debt than other clubs as they only considered the money owed to banks, not to other bodies or institutions. This goes to show that debts are only increasing after each summer. In the midst of such a transfer culture, one team that has done marvellously in the recent past are AS Monaco. In 2011, Dmitry Rybolovlev bought 66% stake in AS Monaco which was approved by Prince Albert II of Monaco. AS Monaco is located in Monaco’s Fontvieille district at the Stade Louis II. The remaining shares are owned by the House of Grimaldi, ruling family of Monaco. Rybolovlev is the current President at the club. Monaco had gone backwards after becoming the runners up of the UEFA Champions League 2003-04. Things were different when Rybolovlev arrived at the club in 2011. In 2011-12, under Rybolovlev’s reigns, Monaco began the season in Ligue 2 after being relegated. It was only in the season of 2013-14, after 2 seasons in Ligue2, that they were back in top flight. They spent £146 million that season on James Rodríguez, Radamel Falcao, João Moutinho and others. Monaco finished 2nd that season in Ligue 1, 9 points behind PSG. Dmitry Rybolovlev, however, realised that such heavy spending would only result in a huge debt and unbalanced books at Monaco. Monaco changed ways the following season in 2014-15 and said that they would focus on their academy instead of spending on big names. In the summer of 2015, Monaco made €162 million from the sale of Layvin Kurzawa , Aymen Abdennour, Geoffrey Kondogbia Yannick Carrasco and Anthony Martial. The story in the beggining of this season has been similar with a huge profit in the transfer market (£247.95 million). Key arrivals for 2017/18 season include Keita Baldé, Youri Tielemans, Terence Kongolo, Stevan Jovetic, Adama Diakhaby, Soualiho Meïté and Jordi Mboula for a collective £91.8 million. Key departures at Monaco include Benjamin Mendy, Bernardo Silva, Bakayoko, Allan Saint-Maximin, Valère Germain, Abdou Diallo, Corentin Jean, Nabil Dirar and Kylian Mbappe for a collective £339.75 million. One of the most respected youth coaches of France, Bertrand Reuzeau, was appointed their academy director last year. 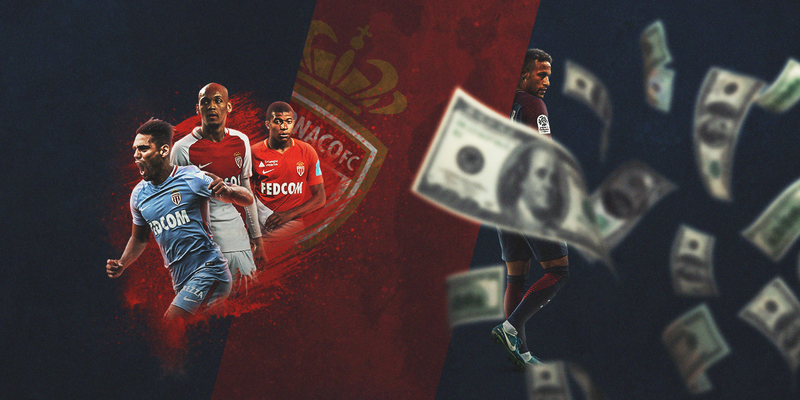 The profits that Monaco made were not used to buy other big name signings, but instead, a part of it was invested in world class young talents between the ages of 18 to 25 years old. The Monaco scouting team are doing an incredible job. Monaco has even proudly presented its academy on its website, and they should, for few clubs are now focusing at the grass root level to polish rough diamonds. Monaco’s efforts paid off when they won the Ligue 1 in 2016/17 season with one of the youngest sides in Ligue 1. This was their first Ligue 1 trophy in 17 years. What sets Monaco apart is not just their scouting but their approach towards running the academy. They equally focus on the players off the pitch and evaluate them thoroughly. Even though Monaco had a decent academy, the arrival of Dmitry Rybolovlev has definitely had a big impact on them. The impact of Dmitry Rybolovlev at Monaco. Born to parents who were doctors, Dmitry Rybolovlev was himself a cardiologist. He has come a long way from Perm, Russia to setting up a business to becoming a billionaire football club owner. One of the most impressive feat has been what Monaco has achieved under him. Manchester United have done it with their class on ’92 in the past. FC Barcelona have fielded a complete playing 11 comprised of academy graduates under Tito Vilanova. The focus on academy graduates and nurturing young talents, instead of spending huge amounts of cash on buying players, has proven to be a successful business model in the past. Returning to this model will serve well for football. Fans of Monaco can now hope that what they’ve achieved is continued in the long run and their philosophy doesn’t die prematurely. Some even believe that the first billion dollar player might have been born. One of the solutions that could be implemented by football governing body is to implement a “cap” on the player buyout clause or transfer prices. Any player should be intrinsically valued with reference to the cap as opposed to the over-valuation being done now. The cap system may not be feasible but can be used as an idea to build upon and come up with other solutions to keep a balance in the transfer window. This cap, if not exceeded, could also give a fair chance to smaller clubs to bid for a bigger name. This “cap” method may not only balance the uncontrolled spending, but it will also reduce the threat of debt or a bubble. A bigger advantage will be that world football will not be dominated by a selected few top clubs. The smaller clubs will also get a chance to bid and the competitive nature of each league will drastically increase. Bringing about a transfer cap is not a complete solution though but just an idea. The sustainability still lies in developing the youth and nurturing talent for the first team. Even though such gigantic transfer prices may partly be balanced by the jersey sales, it is not enough to balance the books. With each summer transfer, if a club is falling into a metaphorical bottomless pit of debt that it can’t come out of, it is not going to become sustainable. Maybe clubs can take a leaf out of Monaco’s book, or Manchester United and Barcelona of the past, to know what could be done to become sustainable and play great football at the same time. In PSG’s case, the club has enough funding from Qatar. But for some others, there’s only so much debt that could be handled before the bubble bursts.